Develop your drawing skills through live drawing. 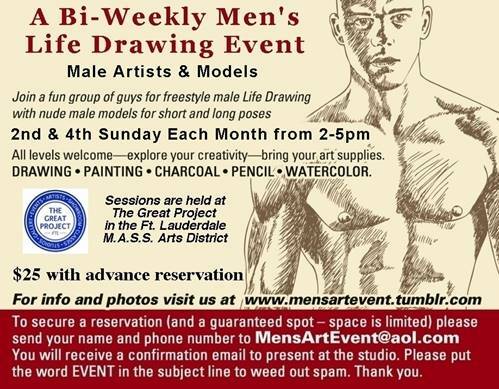 This class is specifically dedicated to the male form. For more information, visit kirksartstudio.blogspot.com. To register, contact Kirk by e-mail or call (954) 547-3146. Also, male models needed! Varied ages sought, but must be height / weight-proportionate and submit recent photo. Fellow nudist can do it all for you -- cook (restaurant experience), clean, run errands, chauffeur, dog-sit (in his home or yours), take care of pool, plants, laundry, etc. Also body work, personal training, companionship for travel, dinner, or parties. Old-school New Jersey Italian -- honest, loyal, fun, reliable. Call Tom at (954) 938-5980 or send e-mail. DISCLAIMER: The WildFyre Society accepts ads for legal products and services from its registered members as a benefit of membership, subject to review, editing, and approval at its discretion. Inclusion on this page does not imply endorsement, recommendation, licensure, or warranty of any product or service that may be offered. The WildFyre Society has no control over, and is not responsible for, the content of any linked website. Furthermore, the WildFyre Society is not an agent in any transaction that may occur between parties coming together as a result of content posted on this page, nor responsible for customer satisfaction or compliance with tax or other governmental obligations of sellers.